FREEPORT, IL - DAVE RUNDALL , Technical Services Manager of Computer Dynamics, announced new technology today designed to dramatically reduce the cost and improve efficiency of business telephone communications systems. Computer Dynamics has partnered with STAR2STAR Communications to introduce cloud technology for business telephones utilizing high speed internet services to unite voice, fax and mobile telephones. Using the power of the internet, cloud technology allows multiple business offices to join together as one for all telephone services including video conferencing and chat. New features like smartphone integration turns a smartphone into an extension of the business phone system - allowing callers to reach business representatives no matter where they are - using only the local business phone number. With the new 'Find Me/Follow Me' technology, calls to a business number or extension follow representatives to phones across multiple locations - to home, cell phone or even back to voice mail - anywhere in the world. Said Rundall, "In the 90s, businesses connected their computers to the internet - and that changed everything. With advanced cloud computing, the internet can now link up business communications like never before. Voice, text, fax and video conferencing can all be managed using just one local business phone number. Business cards will have just one number for everything and callers will be routed to their sales or service representative seamlessly. No more call the listed number - then try the cell phone - then try the fax - then text a message back on the cell phone. This new process eliminates all that - and it saves money." STAR2STAR is an award-winning technology company recognized by INC.500, Forbes magazine and DeLoitte Fast500 for the company's patent pending communications platform. FREEPORT, IL - Scott Piehn, Division Manager of JCWIFI.com expressed gratitude for the role Fire Fighters play in aerial rescue circumstances. JCWIFI is a provider of high-speed wireless internet services to homes and business throughout northern Illinois, eastern Iowa and southern Wisconsin. Wireless internet services are broadcast to users from antenna towers, water towers and grain bins - virtually any fixed structure tall enough to offer a line-of-sight to a wide area of users. JCWIFI technicians are specially trained and recurrently certified to safely work aloft -- sometimes hundreds of feet. 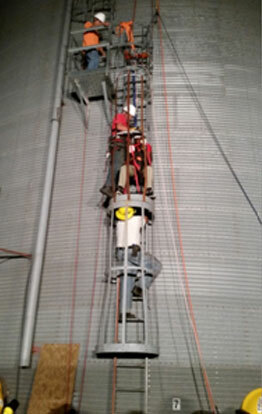 Said Piehn, "We're on towers, grain bins and silos every day installing and maintaining our internet equipment. It dawned on us that we may be able to pass on some of our training and experience to Fire Fighters who aren't regularly facing the dangers of working high off of the ground. We're pleased to share what we know about working up high. It gives us great comfort to know that should one of our technicians, or anyone else need to be rescued, that the rescue crew knows what to do to get someone down safely and quickly." JCWIFI regularly invites area Fire Departments to participate in high rescue training exercises. JCWIFI.COM has over 2400 clients in Northwest Illinois, Southern Wisconsin And Eastern Iowa and is the largest wireless internet provider in the region. Scott Piehn, Division Manager of JCWIFI, announced today the installation of a new hi-speed wireless internet transmitter tower at the West Marina of Lake Carroll. "Based on homeowner inquiries, we've been eager to expand the footprint of our wireless service at Lake Carroll," said Piehn. "This new tower will serve the West Marina area and bring hi-speed internet to homes that couldn't get service before." JCWIFI Hi-Speed Wireless services start at just $24.95 a month. Contact for JCWIFI at www.jcwifi.com or 866.620.3725. Scott Piehn, Division Manager of JCWIFI Internet Services, announced today the completion of a new broadcast tower located in Ridott, Illinois. The new tower allows Ridott area residents and businesses from a wide area to enjoy high - speed, dependable wireless internet services for as little as $24.95 a month. Ridott is approximately 9.5 miles east of Freeport, Illinois. We are pleased to announce that Park Hills Evangelical Free Church has installed JCWIFI High-Speed Wireless Internet services. Another new WIFI Hotspot! JCWIFI is completing a new broadcast tower near Ridott, IL that will expand high-speed wireless internet services to a much larger area. More rural and small town residents than ever will now have access to internet speed and dependability previously available only to city dwellers. JCWIFI has completed a technology upgrade of the company's wireless internet transmitter system covering Lake Carroll. The new technology offers improved speeds to subscribers and is accessible to more Lake Carroll homeowners.